Esports, and other games : Bravehearts! IeSF's official rankings of national teams. The Registered Players are without doubt the bravest, are those who put themselves on the line by representing the country at international competitions. No matter how well they do, there will be those on the side-lines who will always criticize the few that excel. 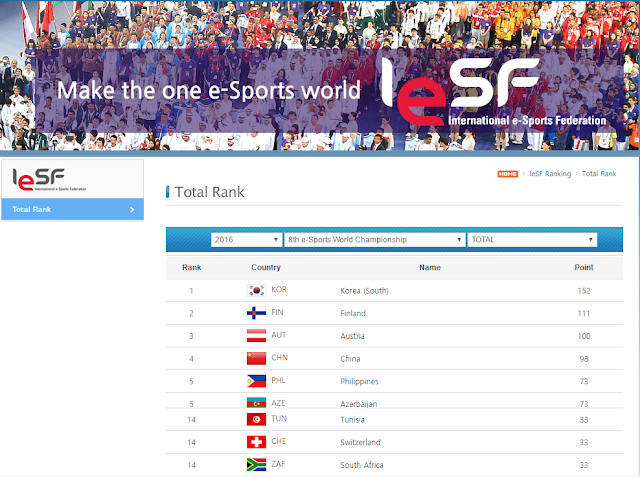 Mind Sports South Africa (MSSA), through hard-work and dedication, was ranked 5th by the IeSF for administration, and 14th for gaming, in 2017. This is no mean feat when you consider the teams above South Africa, or the teams with which South Africa is tied (Tunisia and Switzerland). The team that is selected for IeSF's 2017 World Championships has to fill very big shoes indeed!